You know your life's story is worth keeping. Imagine giving your family a priceless recorded legacy to pass along to future generations. If you don't capture your stories  if they are not collected and preserved  they may disappear forever. Keeping Your Memories personal historian will help you make a first-person record of your heritage. With just a bit of your time you have a simple way to preserve your memories for future generations. Our personal historian will interview you, recording the session on HD video. We then transcribe the interview of your recollections. 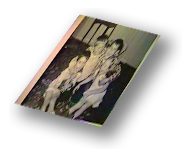 Our transcription and your timeless family photos are published to a delightful Personal Life Story booklet your family will cherish forever. You also get a DVD copy of the videotaped interview!